Figure 5 Evidence that compatible individuals, each of which had access to either a carbon or a nitrogen source, but not both, can share nutrients and enhance joint biomass by fusion, while incompatible individuals cannot. Split plates containing, on one side only nitrogen, as 1 g l 1 monosodium glutamate, on the other only carbon, as 40 g T1 sucrose, were inoculated with paired mycelia of Serpula lacrymans, using either compatible (S7 with S7) or incompatible (S7 with S16) pairs. Plates were inoculated with small inoculum discs placed next to, and on either side of, an air gap. Biomass is in mg fresh wt, means of three replicates, 1 week after inoculation. cords formed to link compatible mycelia while incompatible ones formed a barrage. responses described here to be investigated at metabolic, cell and molecular levels. An intriguing possibility is that fungi optimized for developmental response to nutrients will prove to be enlightening models for dissecting the cellular links between carbon and nitrogen nutrient sensing and cell development. Recently huge advances have been made in our understanding of nitrogen and carbon nutrient sensing and developmental pathways in yeasts (Cooper, 2004). In Saccharomyces cerevisiae (Roosen et al., 2005) the protein kinase Sch9 is a glucose and nitrogen-responsive regulator involved in nutrient signalling, that affects cell size and longevity. It controls the transcription of clusters of genes encoding proteins with functions in proteolysis, stress response and filamentous and invasive growth forms. Together with the transcription factor TOR, it is believed to compose a nutritional integrator system controlling a morphological switch that induces invasive pseudohyphal growth under N-limitation. Amino acids are also sensed by Ssyl, a non-functional homologue of a membrane transporter, believed to undergo conformational change on amino acid binding. 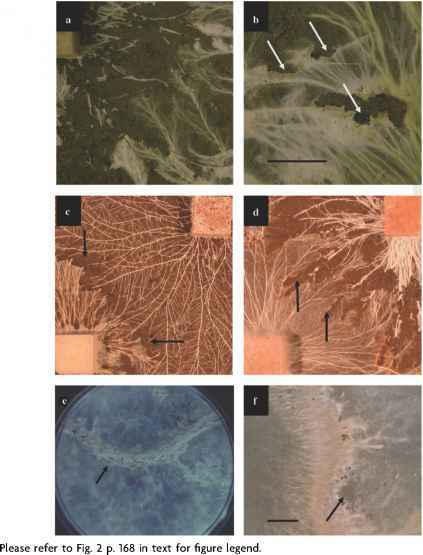 Evidence suggests that intracellular amino acids inhibit the sensing of extracellular amino acids, of interest if this system is conserved in cord-forming wood decay fungi in which the sole amino acid source for mycelium foraging over a non-nutrient surface is intracellular. In ecosystems and microcosms, microarray technology would make it possible to access transcriptional profiles of different foraging phases, and link the expression of gene clusters to metabolic responses. Kasuga et al. (2005) have demonstrated the validity of transcriptional profiling under realistic conditions as an ecological tool. Prediction of mycelial network behaviour would be facilitated by rapidly assessing, in situ, the nitrogen status of mycelium in its forest floor habitat. In preliminary work using sand/wood microcosms, spatial and temporal mapping of gene expression is allowing investigation of differential expressions in parts of a P. velutina foraging mycelium acting as sources and sinks for nitrogen (Tlalka et al., unpublished).